Best Drone Brands 2019 – review of the top 10 drone brands for 2019. DJI, Syma, Parrot, Cheerson, Altair, Eachine, DROCON, Holy Stone, Hubsan, Force1 and more are reviewed. Altair Aerial- a company specializing in RC Toys and based in Lincoln, Nebraska- is best known for their budget category drone models. As we’ve mentioned, drone-flying as a hobby is fast gaining purchase among varied demographics and as such, there is a huge market for drones falling in the price category of $100- $300. And this is the niche that Altair Aerial has targeted and has been pretty successful in their endeavors so far, as evidenced by a number of popular budget drone models that come from the company. The most popular of their models include Altair Aerial AA108, Altair Tomahawk, Altair Blackhawk and Altair 818 Hornet. Currently, all of these models are available at under $200. Considering that the competition is pretty stiff in this category, our verdict is that Altair has done a decent job in providing quality models at modest prices. Altair AA108, for example, comes with a 720p camera, several safety features, FPV with live video transmission and easy-to-fly modes. Which is pretty good for a drone under $150. Or, if you want to own a somewhat superior machine, you may also opt for Altair Outlaw B2W, currently available at a price of $279 from Altair website. Another thing about Altair that deserves special mention is their excellent customer service and follow-up, something especially appreciated by amateur/first time flyers. Cheerson Hobby is a small-ish company based in the Guangdong province, China. As the name of the company suggests, Cheerson drones are meant especially for hobbyists and budget conscious flyers and a majority of their most popular models are available in the under $100 price category. Apart from drones, the company also churns out different manners of remote-controlled toys. The company is perhaps best known for their mini and nano quadcopter models. The Cx-10 Mini from Cheerson is available in a number of different variants and the starting price point is as low as $16, which is pretty awesome! If you're just looking to get a feel of flying UAVs or want to fly indoors only, these nano copters are a great choice. And once you've got the hang of it, you can of course graduate to higher priced models. For example, if you want to stick with Cheerson, the Cheerson CX-33S Tricopter is a pretty neat model with innovative design and quality features for a drone priced at $99. And if we're talking mid level GPS drones, the Cheerson Cx-20 (at $260) is another excellent choice. It is quite a leap from Cheerson to DJI, arguably the most popular drone manufacturer in the industry. Headquartered in Shenzhen, China, the company DJI Innovations has grown in leaps and bounds since their inception in 2006, a little over a decade ago. Currently, DJI boasts of multiple offices in Europe, Americas and in some of the major cities in Asia. Although the company does offer a handful of models in the budget category, it is really in the field of industrial and semi-professional drone models that the company has excelled and is setting new benchmarks with virtually each of their new models and upgrades. Many sectors, including agriculture, conservation, filmmaking, disaster monitoring, surveillance, search and rescue, emergency response and others have put their trust on the advanced, superior level technology that DJI models offer-technologies that, among other things, have redefined the possibilities of aerial photography, filmmaking platforms and equipment. Some of the more popular models from this manufacturer include those in the DJI Phantom series (especially Phantom 3 and Phantom 4 Pro), DJI Spark, models in the DJI Mavic line (Mavic Pro and the most recent DII model, Mavic 2) as also the hexacopter model DJI S900. Most of these models also come in different ‘Bundle’ offers which let you opt for additional features or gadgets (such as flight controller, gimbal, extra batteries, and so on) along with the basic unit. With DROCON, we are back to the lower and mid price segment drones. Drocon, in fact, is often mentioned as a pseudo drone brand since they don’t build their own products, but rather re-brand drones from a number of other manufacturers. Not much is known about the company itself, except that it has an Australian address and a UK website. All DROCON models are chiefly sold through Amazon. For all that, however, Drocon models are popular enough with drone hobbyists. Similar to Cheerson, Drocon is primarily known for their mini models and these are great value for money. However, since these are extremely inexpensive models, it is not uncommon for some models to malfunction. However, as long as you’re buying from Amazon, you are covered on that front, thanks to Amazon’s 30 day refund/replacement/returns policy. The brand also boasts of some popular models in the mid level (under $200) domain, such as Drocon U818 Plus, Drocon Blue Bugs (with GoPro) and the Drocon Bugs 6 which is advertised as a ‘racing drone for intermediate pilots’. Eachine had started out as a company offering super affordable beginner quadcopters. With time, however, the company has evolved and has introduced a number of popular modular-style FPV, GPS and Racing Drone models. But the brand is especially popular with drone enthusiasts for the good prices they offer within the competition. To cite but one example, Walkera Runner 250 is seen as a direct competitor to Eachine Racer 250 and both pack pretty much the same features. 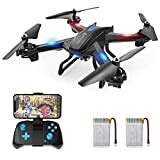 And yet, the Eachine model is not only more affordable, but what we can glean from many customer reviews, it also provides better performance in terms of stability and durability when compared to the Walkera model. Among Eachine’s pricier models, Eachine E511S GPS and Eachine E511 enjoy high popularity as do the Eachine under $100 models such as the Eachine UK65/US65 and the DIY racing drone Eachine Tyro99. At the same time, many of Eachine Mini models continue to enjoy great popularity as kid level drones. Force1 is a fond name in the drone universe chiefly due to the wide range (covering entry-level to intermediate to advanced) of drone models the brand offers at highly competitive prices. When it comes to Drones under $500, most ‘Top Drones’ lists will include at least 4 to 5 models from Force1 and this attests to the versatility of F1 products. Some of the popular F1 models in the Beginner Drones category include Halo3000, UFO3000, Red Heron, Raven and Discovery. In all models of these lines, you get features such as altitude hold, superior stability, 720pHD camera and more. However, the superiority of the Force1 models really become apparent with their intermediate and advanced level drone series. Some of the standout features of the intermediate models (popular: F111 Phoenix, Rogue F72 FPV Drone, Thunderbolt) include Custom Route Mode, HD Camera, Wi-Fi FPV App Control and more. Finally, there are advanced models equipped with GPS-enabled Flight, Advanced Motor Technology, VR Capability, and more. So, we’re talking about models such as F100 Ghost, Bugs6, F200W Shadow, etc.—models that are pretty much household names for all drone enthusiasts. If you’re in the market for good quality, under $100 drones, chances are you won’t get a better mix of quality and features than that offered by a good number of Holy Stone models. According to our research, the original manufacturer of the models (we’ll come to them in a minute) is a Chinese company called Apex and they are then re-branded by Holy Stone. We mention this simply for the readers interested in the source location of the manufacturer. Now, to come to the models themselves (Holy stone F181 RC, U818A HD Plus, Holy Stone X400—all of which are available in the price range of $80-$110), you receive a load of amazing features such as easy maneuverability with hover, altitude hold, headless mode; 4-way flip and other stunt abilities; great camera capabilities for models of this price range; and more. However, what users stress as the most satisfying feature of these models is their great build quality, endurance and durability. In addition, Holy Stone is also famous for providing excellent customer service. Simply browse the Amazon user reviews for these products and you’ll get more than a fair idea of what we’re talking about. Headquartered in Dong, China, Hubsan is another popular name among drone hobbyists who prefer to go for beginner-friendly and intermediate level models. The best-selling series for Hubsan is the X4. The models in this series fall in the entry level category and are priced in the vicinity of $70-$80. Similar to the Holy Stone models, the models in the X4 series provide great value for money principally due to their enhanced durability. For more advanced models, the users prefer the models in H501S and H502S series. All models in theses series are equipped with 1080p HD camera, headless mode and altitude hold functions, in addition to features like FPV, follow Me, GPS Positioning and more. The H501S models also feature brushless motors. Parrot, a French company specializing in telecommunications equipment, is a relatively new entrant in the UAV market. But with its high-end advanced technology wireless products, fashioned in collaboration with some of the most well-known designers in the world, it is aiming to provide new solutions to the drone market for professional/industrial use. Although new to the UAV market, the company has already made its presence felt rather strongly with its line of products that cover both consumer and professional categories. The Parrot Ar.Drone, a mid-range UAV, had made quite an impact upon its introduction in the market. It was cited as the first quadcopter piloted using augmented reality and wi-fi. Its successor, the AR.Drone 2.o features even more sophisticated technologies and is one of a kind among its competitor groups of mid level hobby drones. 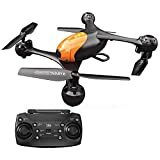 There is also the Parrot Mambo mini drone (with grabber and cannon fire features) which is quite popular with drone hobbyists. However, till date, the Parrot Bebop 2 (at $299) remains the most popular Parrot model. Among other extraordinary features of this model, its flight time of up to 25 minutes (unheard of for a model under $300!) deserves special mention. In addition, Parrot has been equally successful in tapping the professional/semi-professional UAV market with models like Parrot Disco FPV (price: $468, flight time: up to 45 minutes) and the new Parrot ANAFI, the first quadcopter to feature a 3 axis gimbal stabilizer. In short, it very much looks like that along with DJI, Parrot will be the other key player in setting new standards in the drone software, hardware and services technology. Based in Shantou, China, Syma Toys is especially known for its line of popular RC helicopters. X5C helicopter, for example, is a very popular entry level drone from Syma and so is the upgrade version, X5C Explorer. If you want to focus on a particular brand than a model when buying your own UAV, we suggest that you pay particular attention to the price category you have decided upon. Once you’ve done that, you can then zero in on one or two brands that provide best products in that price range. And also, if you’re going for inexpensive, entry level models, our suggestion is that you pay more attention to build quality (endurance and durability) and customer support facilities (return/replacement policy, etc.) than on the number of features. 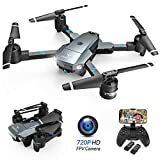 So, if you’re going for a $80 drone, we would recommend you stick with Holy Stone since the company excels in both the criteria we mentioned above. Their models pack a good number of convenient features, too, but that should not be your priority. So, basically, do some research and try to find out which brands provide a consistent line of good models in the price range you have settled for. On the other hand, if you are going for high end, costly, professional grade equipment, always go for reputation first, but also check if the models from a particular company allows you enough flexibility (to upgrade; add other convenient gadgets, so on). So, for example, if you’re going for a $1,000 drone, make sure you buy from the most reputed company in present. As it happens, we would recommend that you go for DJI whenever your budget hovers around that level.